This is the Falling Eucalyptus Faux Suede Throw Pillowcase. 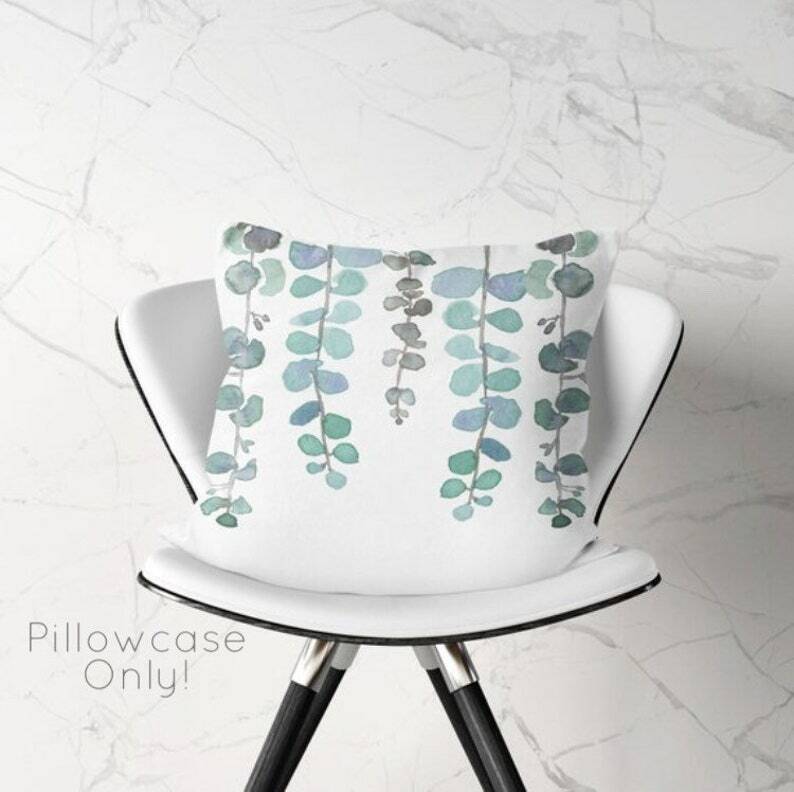 It is a super soft, gorgeous, white pillow printed on both sides with beautiful sprigs of falling eucalyptus. This pillowcase will truly bring your room together with a unique watercolor design that calming, classy, and neutral - it is truly home improvement made easy. You will feel at ease when creating your haven into a place that is truly tinted with your personal touch. This includes ONLY the pillowcase - not the pillow - you must use your own pillow insert. -Multiple size options ranging from 14"x14" to 20"x20"
-To clean your pillow, I recommend taking the case off, turning it inside out and washing it on cold with like colors. Lay flat to dry. Wash the pillow on cold with like colors as well, and tumble dry low. -This pillow has a unique, hand painted watercolor design, designed by me, Jillian Anderson. While I designed and painted the eucalyptus, it is printed with ink using a sublimation printer by my production partner through Printify. They will print your pillow and send it right to your door! -You will receive one pillow in the color and size of your choosing, don't forget to choose your size before checkout.